Looking back on 2012, one of the big highs was creating Thrift-ola's first ever handmade product - Lola. 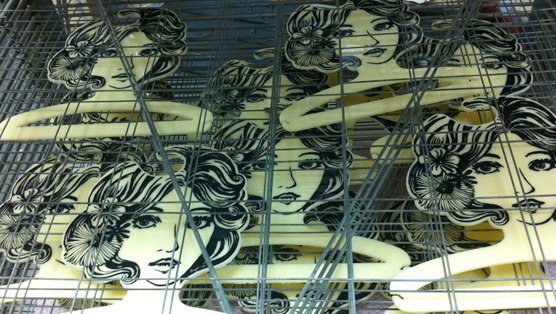 The first batch of Lola's drying on the printing rack. I’m not going to lie, it’s been a bumpy year for Thrift-ola. Up until August I took on too much freelance work to run the business at all and it pretty much ground to a halt. It was on my birthday in September that I decided to focus entirely on building Thrift-ola up again as an all-singing-all-dancing business and that meant sourcing vintage AND designing my own products. I’ve only managed to launch one product so far and that was Lola – the perfect way to display your favourite frock. Having not put anything out there for a good few years, it was more nerve wracking than I expected and cash flow wise it pushed us quite hard.